Tuesday's photo for ReThink Church focused on Wonder. I decided to keep it simple. I found this quote in a book I've been digesting in the last few days "Sent" a memoir of how a family sold everything, and spent three years in a Southeast Asian country, living among Muslims. 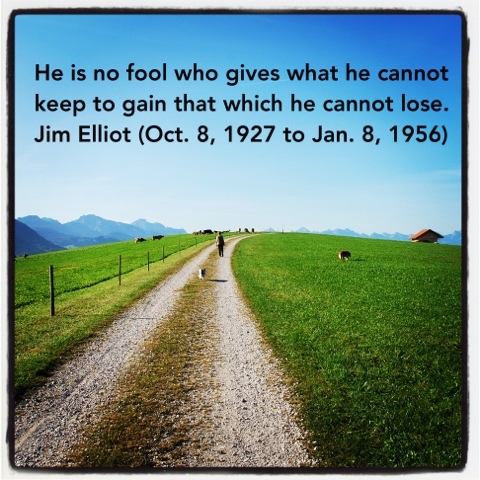 The author closed the book - which details her family's experiences - with this powerful quote from Jim Elliot, a missionary who lost his life serving God. keep to gain that which he cannot lose. I guess today's prompt simply caused me to look for the wonder the family found in serving God in an amazing, and unexpected way.